Bowling Green's Chris Nell (33) looks through teammate Adam Smith and Alabama-Huntsville's Tyler Poulsen to see the puck during Saturday's game (Photo by Jessi Renner/BGSUHockey.com). 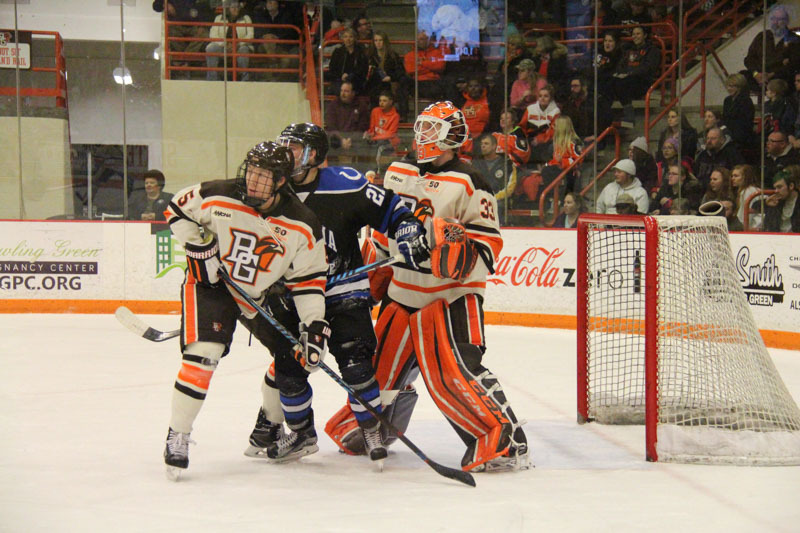 Bowling Green enters the Western Collegiate Hockey Association Playoffs with momentum and confidence. Chris Nell’s goaltending is one of the major reasons why. The junior has posted three straight shutouts, helping the Falcons to a win over Mercyhurst and a regular-season ending sweep of Alabama-Huntsville. The Falcons entertain Ferris State in a best-of-3 Western Collegiate Hockey Association quarterfinal series Friday, Saturday, and, if necessary, Sunday in the Slater Family Ice Arena. Faceoff is 7:07 p.m.
Nell made 71 saves in a 7-0, 2-0 sweep of UAH last weekend and 22 saves in a 3-0 win over Mercyhurst Feb. 11. In addition to the 93 shots, the Falcons allowed far too many quality scoring chances, odd-man rushes and breakaways. But Nell remained poised under fire, turning difficult saves into routine ones. He has a 1.49 goals-against average and a .946 save percentage in his 11 games since returning from the Christmas break. Nell’s school-record scoreless streak stands at 207:31. The last goal allowed by Nell came Feb. 4 at home against Northern Michigan, which scored a 5-on-5 goal at 11:18 of the second period. The 6-foot-3, 184-pounder already holds BG’s career record for goals-against average (2.08), save percentage (.922) and shutouts (11). His four shutouts this season are a single-season Falcon record. Nell’s strong second half came after a difficult first half off the ice for him and his family. His dad, Rick, died unexpectedly Sept. 12. 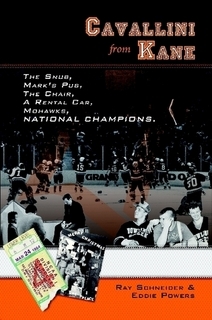 Nell’s parents, Rick and Nina, regularly attended their son’s games at home and on the road. Nina Nell remains a familiar face at BG’s games. “How do you get over something like that? You don’t,” Bergeron said. “But it is has sunk in to the point where he’s figured out what the new normal is for him and his mom. Now, he’s back in his routine. That’s kind of the way 20-year-old people are. They rebound. What you’re seeing as of late, the second half of the year, is more of what we expected the whole year. Nell was a first-team All-WCHA honoree last season, posting a 1.91 goals-against and a .930 save percentage in 37 games. But this season, he stopped just 76 of 91 shots in his first four games. He’s steadily improved since. All of Nell’s shutouts this season have come in the last 11 games. Now, BG is looking for Nell to continue to play well during the WCHA playoffs. He has a 2.19 goals-against and a .912 save percentage in 29 games this season. He’s started 28 of BG’s 36 games.